With summer in full swing here in Oregon, the School of Social Work is switching gears and preparing for the return of students in the fall. Some of our Master of Social Work degree students — those in our advanced standing program — have already arrived and are getting some of their classes completed this summer. Others on our research and community projects teams continue their work year round. One of the most exciting parts of our preparations for fall is the welcoming of new faculty and staff to the School. We’re delighted to highlight here two esteemed new professionals joining our team — a new assistant dean of finance and administration and a new program director for our Bachelor of Social Work (BSW) program. Read this month’s Highlights and Happenings to meet them and get to know them a bit better. This month’s issue also reports on our Ph.D. program presentations at a conference in Korea, an update on our growing and prospering online MSW program, and a profile on a field instructor and student working with LGBT youth at the Sexual and Gender Minority Youth Resource Center. We hope you enjoy learning more about the many facets of our important work in the School. As always, the best way to keep in regular touch with the School of Social Work is to “follow” our Facebook page. What have you enjoyed most so far during your time in Portland? I really like the transportation system. It’s so much easier to get around than in Seattle. Also, the ocean is so much closer and I am hoping to take advantage of the Columbia Gorge. In the midst of the racial and political turmoil that is continuing to bubble to the surface in the US, the common question from white allies and others in the struggle for racial justice is, “what can I do to affect a change in racial equality in my community?” Ann and panel discussed personal and professional solutions on White people’s role(s) in advancing racial justice. Other panelists included Serilda Summers-McGee, Director of Human Resources at the Oregon Department of Education, Rekah Strong, Chief of Operations and Equity at United Way of the Columbia Willamette, and Megan Irwin, Early Learning System Director at Oregon Department of Education. The School of Social Work recently celebrated the contributions of three visiting scholars from the Seoul Metropolitan Government in Korea who are currently studying and conducting research here at Portland State University. The School’s visiting scholars program provides opportunities for leaders in the Seoul Metropolitan Government to study and experience social work and human services programs in the United States. The program is led by Dr. Junghee Lee, director of the Ph.D. Program in Social Work and Social Research, and supported by Dr. Laura Nissen, dean, and Dr. Keva Miller, associate dean of academic affairs. Pictured above are Doctors Lee, Miller, and Nissen with the three visiting scholars. They include Insik Hwang, Director General of Project 7017; Hongyeon Choi, Director General of Welfare Policy Bureau; and Jeongho Kim, Director of Lifelong Learning Division. We congratulate welcome our three international scholars to the School of Social Work, to PSU, and to the Portland community. We wish you continued success in your research and studies here! This past June, Ph.D. Program Director Dr. Junghee Lee along with Doctoral Students Jesse Homan and Katie Winters visited Cheon-An City and Seoul, South Korea. While visiting South Korea, Jesse and Katie spoke at a Welfare Forum in Cheon-An City. While in Cheon-An they met with city officials and mental health providers to exchange research, practice, and program development strategies. They then attended the Joint World Conference on Social Work, Education, and Social Development in Seoul where Jesse and Junghee participated in a panel presentation with a Korean colleague on preventing youth suicide and presented their paper entitled Teen suicide in the United States and South Korea: A cross national exploration of the role of media. This study was conducted alongside researchers from The Catholic University of Korea. About 200 people were gathered in the forum including City government officials, local medical and academic professionals, community leaders, and parents to better prepare and provide preventive efforts at risk youth. The Master of Social Work Program (MSW) at Portland State University is excited to announce that the MSW Online Option — Oregon’s first and only online MSW program — has admitted its third cohort for this coming fall! The program is a three-year, part-time online Master of Social Work degree program that launched in the fall of 2014. Our inaugural cohort will be graduating this coming spring. The original goal of the program focused on providing social work education access to students who resided in communities outside of the Portland metro area who did not want to relocate in order to obtain an MSW. This specifically applied to those who were residing in small rural communities across Oregon. 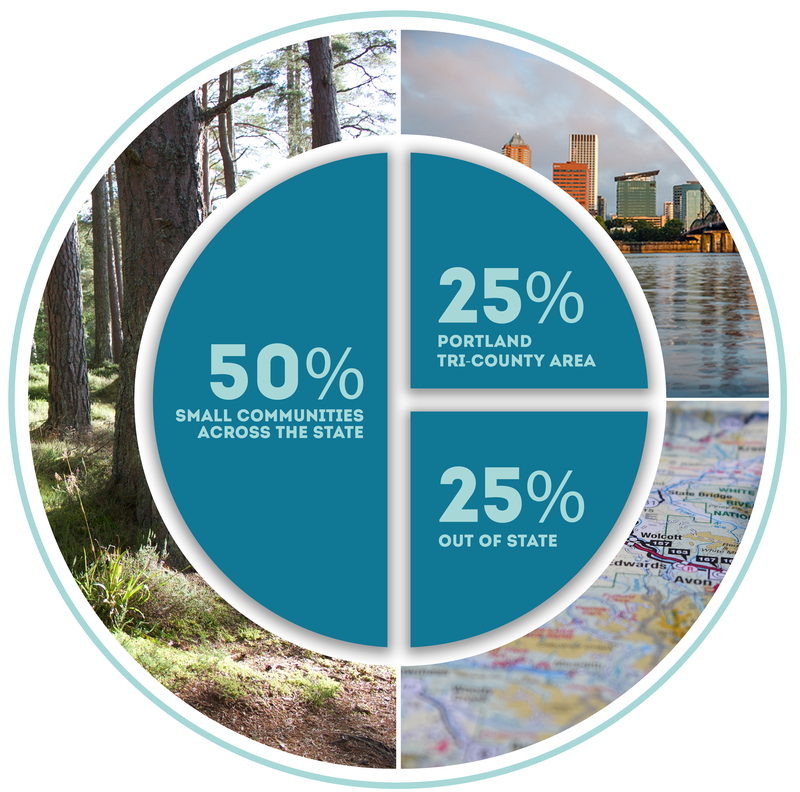 So far the program is exceeding that goal, with 50% of the students among the first three cohorts living in small communities across the state, 25% living out of state (Louisiana, California, Illinois, Alaska, Washington, and Idaho), and 25% residing in the Portland tri-county area. The School recently received a campus reTHINK capacity grant which will support the development of additional online elective courses and will add a second online concentration option. In summer 2017, the program will add four new online electives, bringing the total number of online electives to 13. Over the next few years the School will begin to develop the Health Across the Lifespan (HAL) advanced concentration courses which will be offered for the first time during the 2018-2019 academic year. The School of Social Work is very excited about these expanded curriculum opportunities and grateful for the support from the University and the Office of Academic Innovation (OAI) to continue to expand curriculum options to our students. School of Social Work Associate Professor Dr. Roberto Orellana has had a busy and engaging summer. After receiving news of his selection as our new interim Associate Dean for Research and Sponsored Projects, Dr. Orellana commenced his summer work with a mentoring research meeting in San Francisco during the 24th Annual Meeting of the Society for Prevention Research this past June. A few days later, he went to New York City where he was one of the few academic researchers from around the globe to participate in the 2016 United Nations High-Level Meeting on Ending AIDS. Dr. Orellana was the only participant from a school of social work. After a week in Alaska with his family, Dr. Orellana flew to South Africa where he participated in the 21st International AIDS Conference (AIDS 2016) in Durban. There, Dr. Orellana gave a keynote address to a packed room of researchers and activists who were attending the International Indigenous Pre-Conference on HIV and AIDS. His speech was entitled: Harnessing indigenous knowledge for HIV prevention: Decolonizing combination prevention. His talk was based on his long term work with indigenous peoples throughout the Americas. He also presented two more scientific papers based on the HIV/drug use epidemiological work he has done in the Guatemala/Mexico border region. Battling jet lag, Dr. Orellana has returned from a number of busy summer conferences, “ready for new adventures as Associate Dean.” His goal is to be an advocate for faculty and researchers, continue to engage in innovative research that is guided by social justice to promote healthy communities and human dignity. Also welcoming him back was exciting news that he had received a grant to work on HIV-related prevention research with homeless youth in Portland. Student scholarships make getting a degree possible for so many of our School of Social Work students. With 59% of our students exiting the School with more than $40,000 in student loans, every contribution to our scholarship fund helps. Kenya Luvert, a Master of Social Work student in Portland and 2015-16 academic year scholarship recipient, recently met and visited with the contributors to her scholarship, Marta and Ken Thrasher. Marta and Ken are longtime donors to the School and strong supporters of non-profits and community projects throughout Oregon. Pictured here are Marta, Kenya and Ken at the School of Social Work offices in Portland. Kenya, who did her field internships in the Lane County Family Mediation Program and Bethel School District, will graduate this spring. Congratulations to all of our scholarship recipients and thank you to those donors who make higher education more accessible for so many of our students! Are you interested in preparing the next generation of social workers in your community? Hosting a social work student for a field internship is your opportunity! For Katie Borofka and her MSW field instructor, Bethprana Novi, an invaluable learning opportunity came in Katie’s field internship with the Sexual and Gender Minority Youth Resource Center (SMYRC), a program of New Avenues for Youth. “There are few places where lesbian, gay, bisexual and trans youth are safe to explore their sexuality and gender identities/roles. SMYRC is one of those safe places,” says Bethprana Novi. Beth provided weekly educational supervision for Katie, supporting the development of her social work practice. “My weekly time with Beth has proved invaluable, as I am able to debrief about many challenging situations, as well as talk about concepts and theories and how they can actually work in practice,” says Katie. For instance, she looked at the Identity vs Role Confusion stage of Erikson’s Theory of Social Development and applied that to her work with LGBT youth. Integrating this theory into her practice deepened her understanding of how LGBT youth often deal with rejection, discrimination and oppression from institutions, religions, politicians, family and peers and how that affects identity development. Dr. Thomas Keller, School of Social Work professor and Director of PSU’s Center for Interdisciplinary Mentoring Research, recently wrapped up this year’s Summer Institute on Youth Mentoring. This four-day seminar was provided to mentoring professionals as an opportunity to explore and discuss developing mentoring research and its practical implications for mentor program policies and practices. The goals of the institute include enhancing quality, innovation, and leadership in youth mentoring across institutions that do this work. Research fellows this year included Antoinette Basualdo-Delmonico of Boston University, Michael Karcher of the University of Texas—San Antonio, Elizabeth Raposa of College of William and Mary, and Renee Spencer of Boston University, in addition to a handful of guest speakers. This summer marks the institute’s 10th year. Even for those with insurance, getting mental health care means fighting through phone tag, payment confusion, and even outright discrimination. Oregon State University is getting new, on-campus housing with a special goal: keeping students who are recovering from drug and alcohol addiction sober. OSU’s Recovery Living Community will open this fall. Did You Know the Need for Social Workers Is on the Rise? When you think about jobs that are in high demand, social work may not be the first one that comes to mind. But in this digital age, science and tech aren’t the only fields that are expanding. There’s always been a need for folks with a passion for working with real live people, and as populations grow, change, and age, the need is only increasing. Social Justice Solutions blog post link does not work. Thanks for the heads up, Jan, and sorry about that. The link has been fixed!